Yay!! I went for the first time in September and cannot say enough great things about it. Everyone was right when they told me I would love that city. London is diverse, active, and incredibly charming. I couldn’t stop taking pictures of cute buildings! I’ve had a few friends ask for me to write up a little post about some of the things I did while I was there, and I’m always into sharing ideas so I thought, here goes nothing! These photos aren’t very high quality but the recommendations are! (see what I did there?) I found each of these recommendations from other trusted blogs and personal recommendations. Whenever I travel somewhere I like to get the local’s perspective or at least the opinion of someone who has been quite a few times. If you do one thing (food wise) while you’re there I recommend it’s this. The views are incredible and you will feel like a very elite person making your way to the top. Make sure you dress “smart” (i.e. no workout clothes or tennis shoes) or else they won’t let you in. I made us a reservation at Sky Pod Bar for drinks (amazing cocktails!) and Darwin’s Brasserie for dinner. You could honestly just go for cocktails and be good. It’s truly a unique experience. 2. Make a tea reservation at Sketch. That face you see right there is pure giddiness. I’ve always wanted to do a formal tea and all my wishes came true. Plus they came true at the most aesthetically pleasing and unique place of all! Now this tea was everything I hoped it would be (and more probably!) but I won’t lie and say it was cheap. This place was very pricey. I didn’t understand how pricey it was from other bloggers sharing it but I want to be up front with you. Will it be something you’ll never forget? Yes (unless you hate tea). Will it maybe be the most expensive food experience of the trip? Probably. Oh, and definitely make a reservation my friends!!! p.s. check out the bathrooms…. I try to stay away from overly touristy things when I travel as I don’t particularly like crowds or tours, but Borough Market is worth it. We went for a late breakfast/early lunch and there were almost too many good options. Also, my sister has Celiac’s and she had a ton of gluten free options to choose from! I got the hot pork belly sandwich smothered in bramley apple sauce from ROAST and holy smokes my taste buds were happy. I know that sounds obvious but there’s something to be said about getting a little lost in a new city. We got off on the tube stop closest to Sky Garden and just explored before our reservations. There was so much in that area including Tower Bridge, London Bridge, The Tower of London, and a million commuters leaving work! (something we noticed: do all business men in London only wear navy suits??). London is such an interesting city with it’s old history and new (and architecturally stunning!) buildings. P.s. Please admire the slightly hysterical face I’m making in this photo. We had not slept in over 24 hours and I was losing it a bit. It’s almost impossible to see it in the States at this point so why not see it in London? My dad and I waited outside of the theater for return tickets at 5pm (they let you know if there are any return tickets around 6:30) and we got in!! Plus we had made some British friends (a mom and daughter that were so sweet!) while standing in line and we ended up all being able to sit together. It was a dream come true! Oh, and yeah the show exceeded my expectations. I was seriously blown away. Day trip to Windsor and exploring Windsor Castle. Such a neat experience! Castles!! 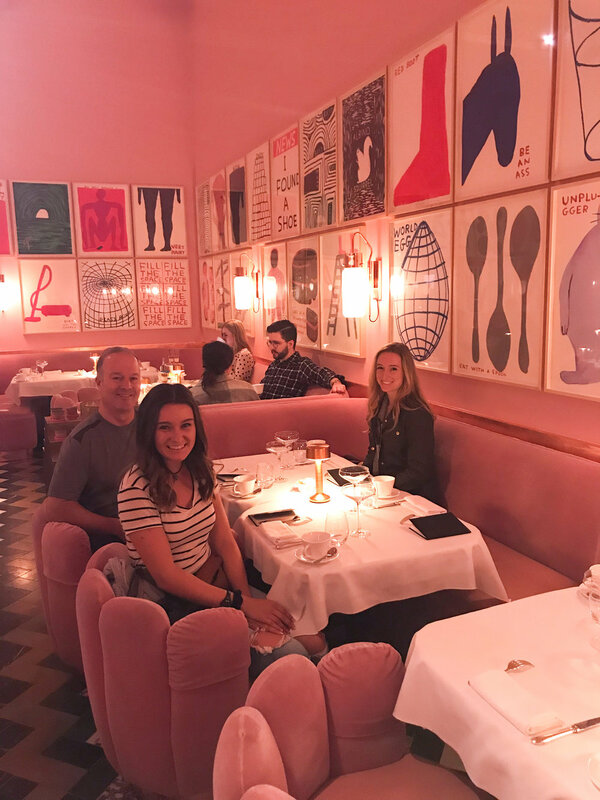 We ate at Blanchette in Soho before seeing Dreamgirls on the West End and it was such an adorable French restaurant! Buckingham Palace and St. James Park. You just have to see the palace because #history. In St. James Park they put out lounge chairs on the grass because it was a nice day and I thought that was particularly lovely of them. Thanks for a great time London!